I was 19 when I had my first birth. I was young and uneducated about a lot of things involving life and health. My husband had just finished EMT schooling and was one to trust doctors and do as they advise without question.. 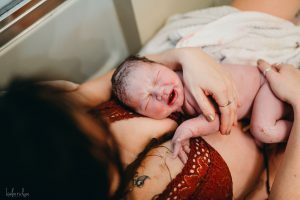 I knew that wasn’t my belief but I wasn’t sure what was, so in an effort to minimize conflict between my husband I went along and laid down my desire and curiosity for looking into home birth, and had a traditional OB. 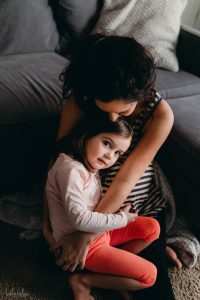 I told my OB of my natural birth plan and he acted supportive but at just 40+3 he induced me for no reason (I later found out, he induced me because he was about to leave for vacation..) It was a traumatic labor and birth that took counseling to deal with, especially since my daughter ended up in the NICU. 3 years later I am pregnant with my son and know now what I want and live a completely different lifestyle then the years past. I hired a midwife and looked forward to my home birth alone with just my midwives team and a photographer. I started losing my mucus plug and having severe contractions on and off starting at 36-37 weeks. It was so frustrating as I got to 38 and 39 weeks having these painful contractions without going into active labor.. I know now my body was making such great progress. I’m so thankful for the preparation. It made active labor that much easier! Around 2:30am I woke up to pee like usual, and when I got back in bed my daughter woke and smiled at me and we snuggled and shared a sweet moment as she fell back asleep. I remember thinking I really need to soak in these last moments of just us, and I was happy to be just me and her in that moment. Five minutes later my water broke. A little gush like I had just abruptly started a watery period, my eyes widened and I stood to go to the bathroom to see what was going on, and the waters just soaked the carpet as I walked, with each painless contraction water would POUR out of me. I just stood in the tub and let it come. I called my midwife and she turned out to be sick so I got hold of her sub and the team headed over. When they got to my house and checked me I was 4 cm. They set up the birthing area in my room as I kept laboring with out any pain at all still. Then at about 7am the team went out for breakfast and I had my mom and ex take my daughter too so I could labor alone in the quiet with just my photographer. I bounced on my ball, went up and down the stairs, cleaned the kitchen and living room up, still no pain but the contraction were becoming closer, longer, and more powerful. Then my photographer and I took a walk in the light rain. Just to my stop sign and back, that definitely helped to get the contractions going, but still not painful. When I got home from our walk my contractions were lasting 45 seconds and occurring every 2.5-3 minutes. My midwives came back from breakfast and observed me for a bit. They weren’t sure how to gauge where I was at because I would just close my eyes and breathe through the contractions but wasn’t in pain. They decided to stick around though since they were so close together. I went upstairs and turned on my music and danced a bit. Within 20 mins my contractions were getting close to painful so I told my team to fill up the tub and when I got in I was at 10 and the pain had finally started coming with contractions. I was breathing through these and trying to just ride them and wait for the fetal ejection reflex, but after 40 mins and the pain just becoming pretty bad I needed to start assisting my body and pushing. because my instincts were telling me this baby is too big, this isn’t good. I pushed for about an hour going from toilet to tub back and forth. I finally pushed out his head on the toilet and stood up to finish pushing it out, then got onto all fours on the floor. I could feel his shoulders were stuck. I could feel the panic/tension of everyone in the room but no one had to tell me what was occurring. I knew it. I decided in my head I needed to push as hard as I possibly could one last time to see if he was truly stuck and this was an emergency or not. and felt my midwife go in and push a shoulder to help him come through, and pop he was free! I turned around to see my baby and he was blue and went limp. Panic set in, this had happened with my daughter for different reasons. “Is my baby dead?! Is he dead?” I kept asking. My midwife said “no, he needs you. Talk to your baby.” And I rubbed his head and kept saying his name. They used the bag only twice and he was back and recovering. He had his color back very quickly. I was so happy and what had just went wrong for a minute was over. No nicu stay, no episiotomy, no vacuum/forceps, or antibiotics. 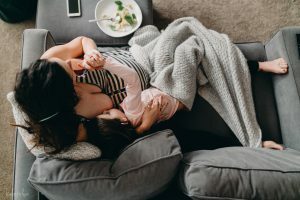 I was so grateful in that moment that I had been home and not had those harmful interventions, that made my daughter ill.
My placenta came out immediately after my sweet son and it was huge! I cut the cord and waddled to bed with baby poop and blood on my chest, happy, relieved and exhausted. I would never birth any other way after my experience. I absolutely loved my midwife and her amazing team and would do everything the same! I loved that in my home I had my painted birth affirmations and verses to keep me uplifted. 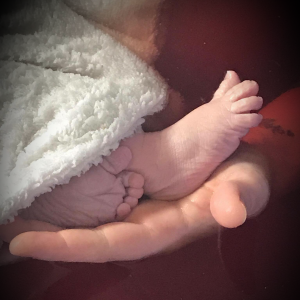 My midwife prayed over me constantly during labor. Side note: I did test positive for GBS with both pregnancies. The hospital birth I had the antibiotics during labor. For this birth I treated myself naturally with probiotics and strict diet from 37 weeks until birth. He was absolutely healthy and did not have any complications from my GBS. 🙂 He also sleeps much better than my daughter did and doesn’t spit up hardly ever!